Some progressive websites believe so strongly that conservatives are jack-booted racists that they will post anything that proves their bias. 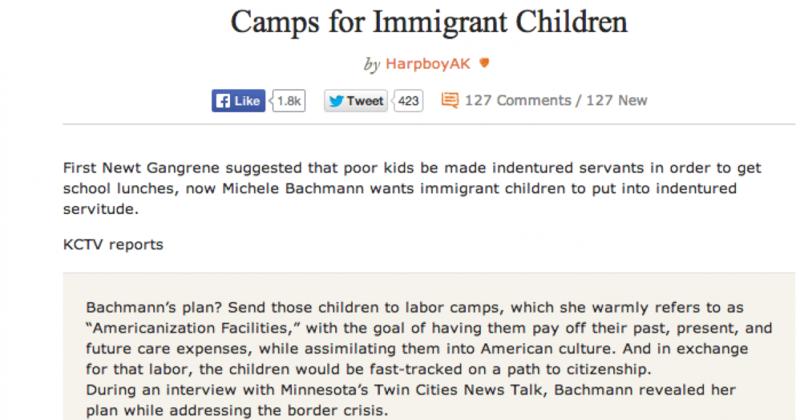 Over the weekend sites such as Think Progress, as well as Daily Kos and Crooks and Liars, were fooled by a fake news item published on a fake news site claiming Rep. Michele Bachmann (R-MN) had advocated “Americanization” camps for undocumented migrant children. Send those children to labor camps, which she warmly refers to as “Americanization Facilities,” with the goal of having them pay off their past, present, and future care expenses, while assimilating them into American culture. And in exchange for that labor, the children would be fast-tracked on a path to citizenship. During an interview with Minnesota’s Twin Cities News Talk, Bachmann revealed her plan while addressing the border crisis. “I’m calling on all of us, Obama and Congress and everyone, to chip in and build special new facilities… `Americanization’ facilities, if you will. And we’d send these kids to these facilities, in Arizona and Texas and wherever else. And we’d get private sector business leaders to locate to those facilities and give these children low-risk jobs to do. And they’d learn about the American way of life, earn their keep, and everyone wins in the end.The three websites reported the fake story verbatim without checking the story.